Exterior Glass Mat. 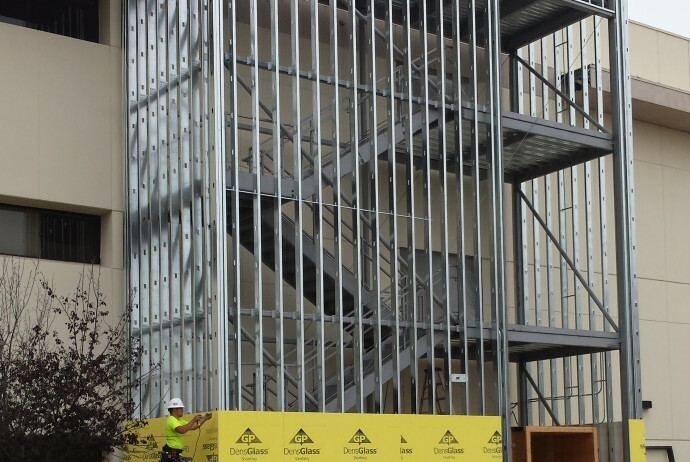 Sheathing | West Coast Drywall Construction Inc.
WCD is installing Exterior Glass Mat. Sheathing (EGM) at our Vandenberg Air Force Base project. EGM integrates a water-resistant, treated core with a fiberglass mat face and back to provide superb protection from the exterior elements. EGM Sheathing is lightweight and easy to handle, It can be cut and fastened with standard drywall tools and fasteners. The product is much easier to work with than cement board, fiber cement sheathing or magnesium oxide sheathing which tend to be heavy and brittle. EGM Sheathing is extremely resistant to rippling, buckling and sagging, even under humid conditions which makes it a particularly suitable choice for exterior applications as a substrate for Plaster, EIFS or Cement Siding.